When you initially look at modern or even most vintage cars, they are sharp, edgy and dynamic; this is of course on purpose. The slit-shape lights and refined edges say, “I’m a mean-speed-machine.” But what if you were in some way to reverse that thinking. Maybe, just maybe, we would have a very different relationship with our motor-buddies if we could be less aggressive behind the wheel? Maybe we would just be a little more at ease whilst winding our way around our busy cities. 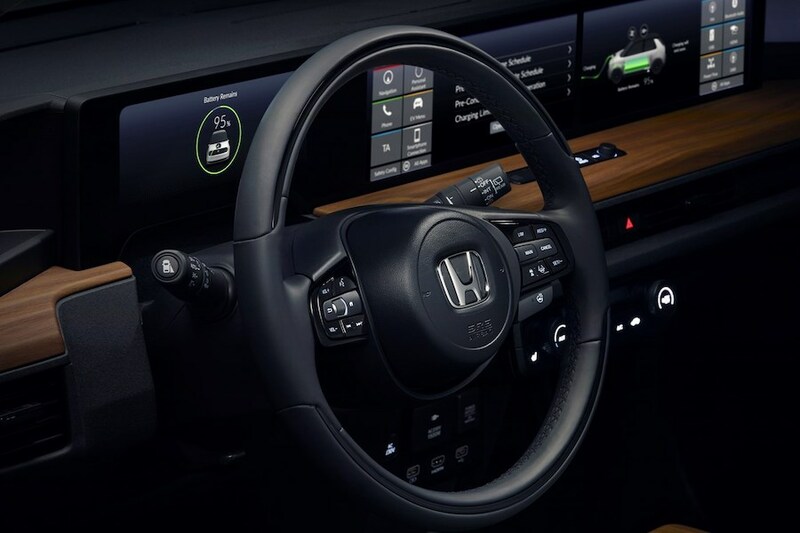 Honda has stepped forward with an impressive new design of a car that is so relaxed to look at and is so modern that when you get inside, it almost feels like your very own living room. On seeing the car initially, all it felt was needed, was to literally add a potted plant and one could be in one’s own home, not inside a zippy city car. First, looking at the exterior, you can see how it is softened, curved, that the lights at the front are purposefully round like ‘smiling eyes’. I kid you not. A perfect example of where the best of retro meets with the modernity of technology. Although not specified it seems the development of this rather stunning project has taken Honda approximately 2 years and is their first step into EV motors. 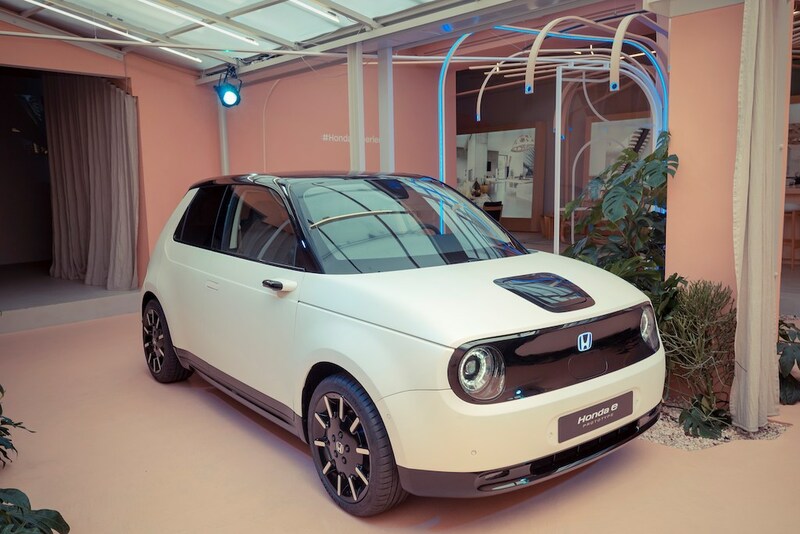 This is in fact, part and parcel of the concept behind the new Honda e Prototype; a car that has already made numerous headlines since the concept version was first shown at the Frankfurt Motorshow in 2017. It is Honda’s first battery electric vehicle for Europe: An EV family city car bourne of a very new dynamic in car building. Something that is so beautiful and graceful to look at and on top of that it almost smiles at you, with its big round lights, when you first look, offers an immediate harmony. Honda believes we as humans now have a need to create personalised spaces through the combination of sometimes unique items, different periods and backgrounds. The key phrase Honda talked of across the launch event was as mentioned ‘seamless living’. A synergy of lifestyle: your car should very much be as personalised as anything else in your world you choose to represents your personal space. Think of the relationship so many have with their Apple products, well this is the car version of the same thinking. It has those white rounded edges like a modern soft shape with echoes of the past (there are certain hints towards the original Golf shape, for example) It will be sold in white with black wheels and trims on the exterior. This brings the contrasts and cleanliness of the shape into focus but there are some discussions of the other colours to come. The front is as streamlined as any i-phone. A black screen for the number plate that also houses the lovely round ‘smiley lights’ (full LED) hint at the technology behind it. The power point is slap bang in the middle of the bonnet meaning it doesn’t matter which country you are in, charging will work easily anywhere. Other clean lines include door handles that sit flush to the car’s body, popping out when used and no traditional door mirrors instead just small camera for seeing traffic shown on small screens placed in each corner of the dashboard. Very sleek, like the fact there is no inside rearview mirror as it works to the same principle, just camera feeding the information to the driver. It has a single rear-mounted electric motor powering the rear wheels with the battery being under the car. The initial concept sported two doors but the proto takes it to 5 (including the boot) making it a useful family run around, and like the original concept car, it’s a four-seater. It will take 30 minutes to charge (80% of the battery) on a high-speed charger and can run for around 120 miles, with price looks to be in the early £30,000 range so it will be seen very much as a little slice of luxury in a city-style auto. Production will be early next year with orders being taken the end of this year and interest already being logged by the company. Whilst talking with Ken Sahara (Exterior Design PL), Akinori Myoui (Interior Design PL), Kotaro Yamamoto (translator) we were able to clarify a few key points regarding the whole project. Firstly we asked, why a town car? They commented as it is Honda’ first ‘move’ into EV, a small city car makes sense. Batteries are still developing in this field so it’s a sensible place to start, as well as still being that Europe is a huge potential market for EV cars. Like many designed items from across the product world, from cars to fashion to home, in order to ‘break’ the market brands often start in the UK as it is seen as one of the most sophisticated markets in the world. Break the UK, then you break Europe and then the world. The Honda team also felt there was ‘clear water’ to be seen in Europe and so the car was very much created with this in mind. A small city car with a real design ethos behind it, the kind of small city car very popular in Japan already yet still can make an impact in Europe. Honda, after all, is a brand, known for making small cars. Small is very much part of their DNA. The visual of the car is ‘like a car’ i.e it is recognisable to us as a car the moment we look at it. The time for spaceship looking cars is not now. Batteries, in theory, could go anywhere maybe with new generations car will move into other spheres. But don’t expect round or triangle cars just yet, we still need to bare in mind safety options like Crumple Zones and a familiar shape for the time being helps our emotional perception of these relatively new EV cars. And regarding streamlining? the shape is not instantly thought of streamlined but actually as it is a short town car that is not an issue however the air does pass under the car because of a flat under-carriage. (where the battery is cased). When designing a car with no wing mirrors but small external cameras, as designers how did this work? This was approached was by looking at the trajectory of how the head moves when looking at the mirrors when driving. The percentage of movement is exactly the same as with traditional side mirrors as with these cameras, as they are placed in just a slightly different place. Therefore the same angle of movement the head would be made. Meaning to adapt is relatively easy because its a very similar neuro pathway as such, that would be used. Think of it as a simpler (far, apparently) version of moving from an automatic car to a manual car. A slightly weird but ultimately very easy swap. The trajectory that the eye-head movement will be was chosen by the designers very purposefully with the placement of a camera to make this change smooth and seamless for the new driver. And then that swiping dashboard! This is what really good design is about. We are all acquainted with swiping our phone and our tablets so it only makes sense that the dashboard works like a giant i-phone. The first in the market place to have a ‘double-usage’ as such. What this means is the passenger, as well as the driver, can work the dashboard apps. So want to check the weather? where you are going? or look at traffic? or even choose the soundtrack to journey? the passenger can do all this and then slid any info over to the driver. 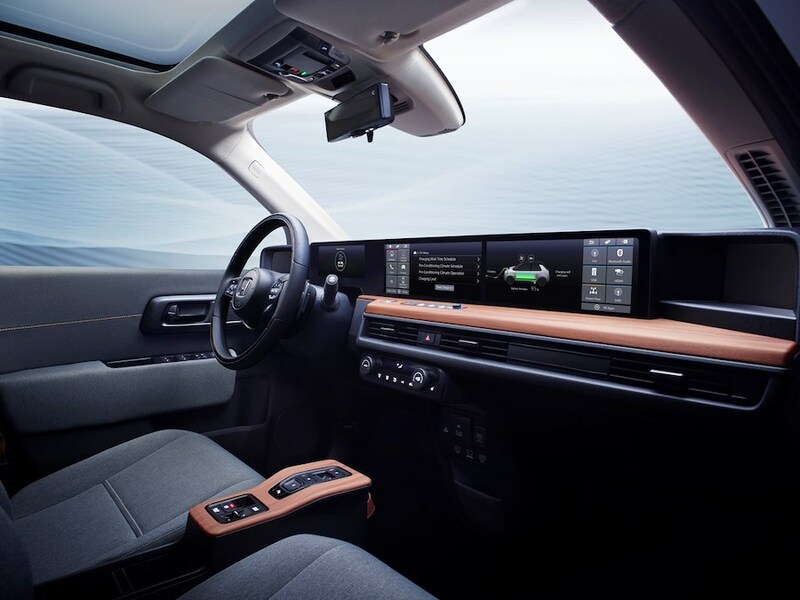 This almost makes the driving experience become a connected experience for the passenger as well as freeing up the driver. As far as design is concerned it seems this was a very purposefully part of the project as it is such big steps away from current thinking. Both designers talked of people and times in design that influenced them with Ken Sahara (Exterior Design PL), talking of the genius that is Deiter Rams whilst Akinori Myoui (Interior Design PL), talked of Scandinavian furniture design as an important movement for him. Both references are obvious once you know and can be seen across both the exterior and interior, giving a real design presence to the car. Things like the wood interior trim looks so Scandi but has a purpose far more than just a visual aesthetic, wood explained the designer takes us back to nature, it grounds us, it is soothing and relaxing it says living room bookshelves, not car interior. A little bit of hand-finished feel of luxury but not a luxury car. Honda is, after all, a company that mass produce cars and not in the luxury sector but design is very visual and important to the brand. One of the most interesting things learned whilst discussing the car with the designers was what Ken Sahara (Exterior Design PL) said. The inspiration for the project was ” every product except car design” and this shows. It also is interesting a word both mentioned was the Japanese word Nagomi which can translate as tranquil, which is exactly a key feeling the team want people to experience with the car. The word is made up of three characters in Japanese which together mean words like harmony with your environment or even cosy and balance. Think of those traditional bamboo houses and that gives you a starting point. As far as green statistics are concerned it is a little too early for real customer feedback but the press certainly is pushing the subject, The proto is not a green version as such but going into production the green elements will be high in terms of production value. Utilising as many biodegradable materials and recycled materials as possible and also having the cars built with good green practice like utilising heat produced from manufacturing to be used elsewhere, little or no water waste, etc. In the future (as with lux car market) we will see things like vegan leathers coming in to play. As it stands, everything that will be used in this build will be as recyclable as it can be at this point. And for the future? More potential colours may be added even the potential of different styles but this is still very early in this journey. What is for sure is that their journey as designers and creatives will be regarded as key information to then bring into play with other cars within the Honda stable. There is definitely a commitment to moving forward positively from what has already been achieved. Adding as they go along more green elements more sustainability as well as more recycled elements. Also, the design journey seems to have been very freeing for both designers who wanted to produce ultimately a high functioning yet simple and friendly car. There is a clear design thread picked up from multiple aesthetic mediums of design that feedback into this car. There is a sense of joy and accomplishment that is evident when discussing it with the teams behind it. A design which marries with usability. It’s all exceptionally well thought out, considered and executed.